The first 2 nights here I woke up at 2 or 3am, drenched in sweat, and feeling so hot and dehydrated I was utterly unable to sleep at all. The third night my colleague left, and suggested I sleep on her bed next to the window. There was no net over that bed, but I gave it a go, only to find that at 3am I woke up again, scratching away at the bites on my stomach, lower back, arms, neck, face, soles of my feet, and the back of my hands. Eventually I moved back into my own bed with the net over it, and wedged the door to my bedroom open with my handbag, as there’s a nice breeze out in the corridor (due to the lack of roof on one end of the hotel). I realise that in general, leaving your handbag wedged into the door of your hotel room while you sleep is not the brightest idea in the world, but thankfully this is the Philippines, and after 3 months here I can tell you that people here wouldn’t dream of taking it, or walking into my room and stealing my stuff while I slept. Plus it was three in the morning and my handbag was the nearest thing to hand, and I was literally melting. The next night I decided to use my hiking boots to wedge the door open, and managed to get through most of the night without feeling like I was in the Black Hole of Calcutta. It was not exactly an uninterrupted night however, as around 4am the dogs and cockerels decided to have some sort of vocal fight to the death outside my window. Then of course you have the rain. Guiuan is a tiny peninsula stuck out on the edge of the enormous pacific ocean, and so it doesn’t exactly drizzle here. Rain blows in off the ocean in sudden, sweeping sheets that pours out of the sky in the middle of the night and drums very loudly on all the corrugated iron roofs…. Then of course a bar opened up across the road, with live singers and bad karaoke going well into the night thanks to their generator, so there I am, lying awake once again at 3am, hot and sweaty and tired, wondering if I was being punished for something. Sunday was my chance to lie-in, but as the door to my bedroom was wedged open, my ludicrously chirpy colleagues kept calling out “Good Morning Maya!” as they went past my room at 6am on their way to church. Sadly I wasn’t able to unleash the full force of my withering glare at them in my weak and exhausted state, so could only grunt vaguely at them from my bed and thank god I had reasonably un-embarrassing pajamas on. However, in spite of my hot, sweaty and uncomfortable nights, I did hear something yesterday that made me smile. I went with a few colleagues to have dinner at the new bar across the road (Amy’s BBQ house). Thankfully it was Sunday night so the music was slightly more subdued. We got chatting to the owner, a German guy called Klaus, who told us that ever since they re-opened, he’s just been so thrilled. He said night after night, people come here to eat and drink, and hang out, and everyone is smiling and laughing and having a good time, “something I haven’t seen a whole lot of in the last 3 months since Yolanda”. He said it’s really fantastic, getting to look around his restaurant at all the smiling faces and happy people after such a long period of misery. And that really struck me, as I looked around the bar and noticed for myself all the happy smiling people, and thought about all the epic devastation I’ve seen since I got here. And suddenly I felt a lot less pissed-off about the late night noise and bad karaoke. These people need a bit of fun in their lives again, a place to go and eat and drink and be normal again, just for a night. So I think perhaps I’ll be a bit less grumpy next time, when I’m lying awake at 3am, sweating into my mattress and listening to the sound of a middle-aged man drunkenly impersonating the Cheeky Girls across the road. I just hope we get another storm soon and the weather cools down a bit! Ok, so I drafted this post at the beginning of last week, but I’m sad to say things haven’t improved. I’ve been getting more and more conscious of how damn tired I am right now, to the point where I almost burst into tears in a meeting on Tuesday after our team got a bollocking. I’ve been here for 3 months now, and am still mostly working 12 hour days, 6 days a week. Thank god I’m going on leave in about 10 days – I need it badly! Can’t wait for 3 whole weeks of chilling and relaxing with some family and friends in Oz. 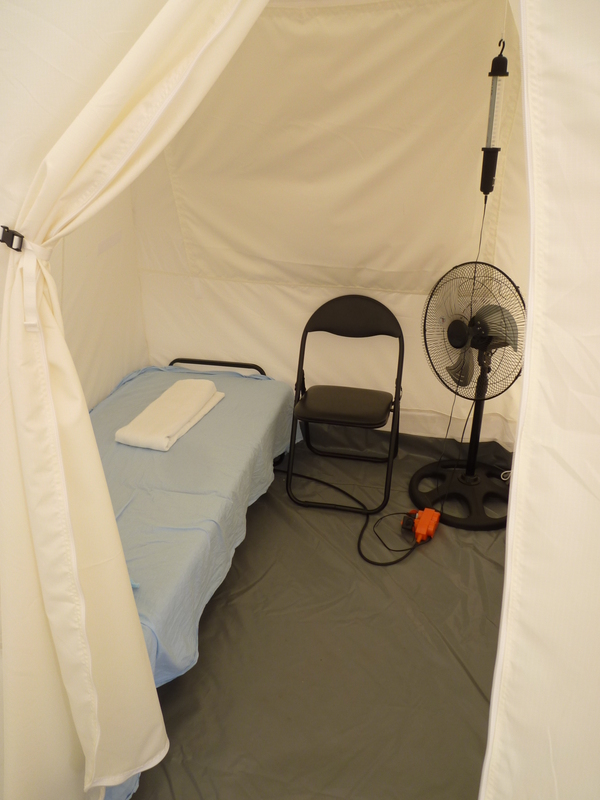 I got moved out of the hotel and into the UN Hub yesterday, as there are some new staff coming in who need the room I was in. 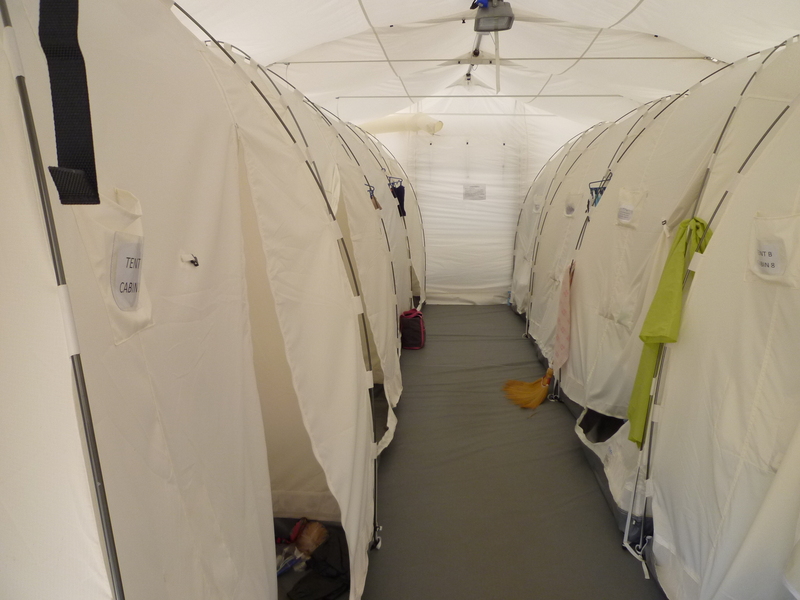 The hub accommodation is a series of small tents inside a big tent and although they do have power and a fan (yay!) it’s also a tent, so you can hear pretty much everything everyone is doing. However, today is Sunday, and I was planning to just sleep and sleep and sleep and chill out all day. Then a colleague rang me at 7fucking20 am this morning, because she’s just come over here from Oxford and is jet-lagged, and forgot it was a Sunday and assumed everyone would be up and about. Could I get back to sleep after that? I love her dearly, but it’s going to be a while before I forgive her for ruining my lie-in.